Sean Dolan of Hopewell Valley, Devin Hart of Pt. Pleasant Boro, and Victoria Vanriele of Governor Livingston represented New Jersey well in a stacked mile field during Saturday's New Balance Indoor Grand Prix in Boston, MA. 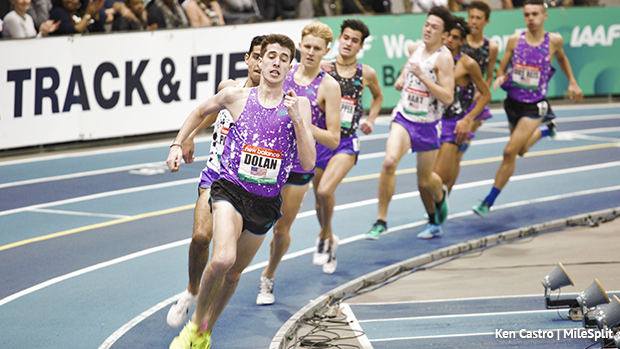 During the junior boys mile Dolan, the defending New Balance Nationals Outdoor mile champion, came through the mid-point around 2:09 running third then closed strong running a 4:13.04 US#2 to place second behind Matthew Payamps of New York who won with a US#1 4:12.39. 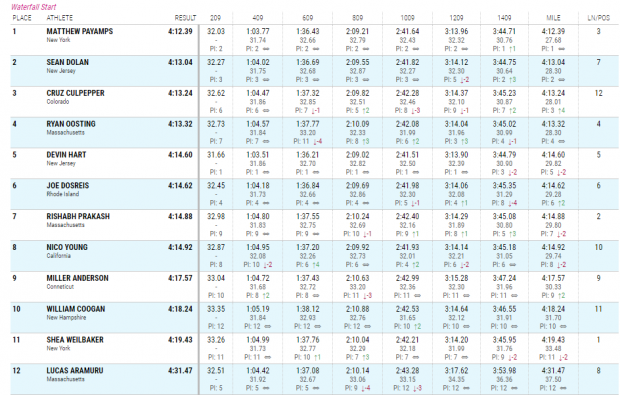 Devin Hart took the lead early on eventually falling back to fifth crossing the finish with a 4:14.60 US#9 performance. In the girls junior mile Victoria Vanriele placed sixth with a time of 4:55.85 NJ#2 US#13. She had the lead the first half of the race coming through midway at 2:29.55. These are solid indoor PRs for all three, even considering 1600m conversions. Dolan's best indoor mile going in was a 4:16.68 and Hart had recorded a 4:16.60 over 1600m just recently at Ocean County Championships. When you look outdoors Dolan ripped a 4:08.86 during the adidas Boost Boston Games last spring and Devin Hart won the 2017 NJSIAA Group 2 1600m title with a 4:09.49, that converts to a 4:10.94 mile. 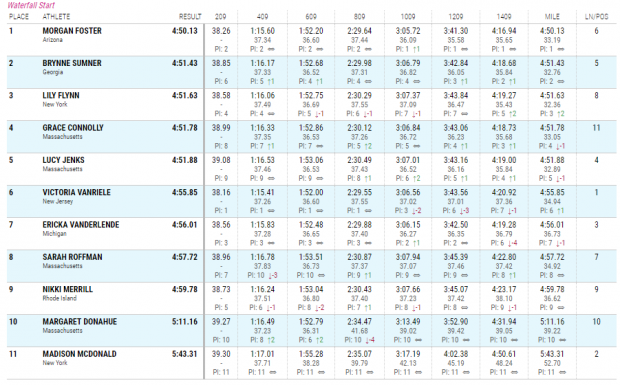 For Vanriele her previous indoor best was a 4:59.87 from last year's Millrose Games Trials, these even bests her fastest outdoor pace in the 1600m which was a 4:55.92. Already this season Dolan threw down 2:25.39 NJ#4 all-time 1000m earlier in January during the New York Road Runners Night at the Races. He was invited to and plans to run in the high school mile at the Millrose Games on February 9th, which will keep him from advancing in individual events during the NJSIAA State Championship meets due to conflicting dates. Hart has some incredible credentials himself and has won five straight individual Meet of Champions titles spanning cross country, indoor and outdoor track. Victoria Vaneriele, who is only a junior, has won four Meet of Champions titles in the 800m between indoor and outdoor. New Jersey track and field legends competed... Sydney McLaughlin had her professional debut running a world leading time of 1:09.46 over 500m. Edward Cheserek finished second in the 3000m with a time of 7:42.93.